How does residential electricity work? 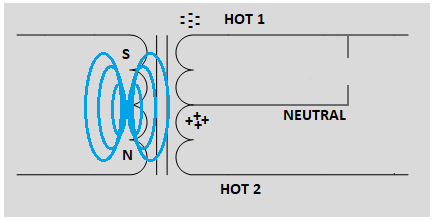 1) When the circuit is closed, are hot 1 and neutral both "hot"? That is, are they both carrying a current of 120V that is alternating back and forth? 2) When the circuit is open, there is no current flowing. 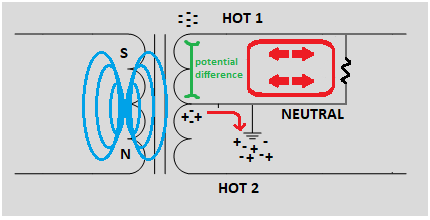 So, what are the electrons in hot 1 doing? Are they still oscillating back and forth? In other words, when a conductor is "energized" but no current is flowing through it, how are the electrons behaving? 3) When the circuit is open, the neutral is not "energized" like hot 1. Why not? I know it has to do with it being grounded to the Earth, but I have not found an explanation of what is happenening at the level of the electron. Are the electrons alternating back and forth in and out of the Earth instead of through the neutral wire? 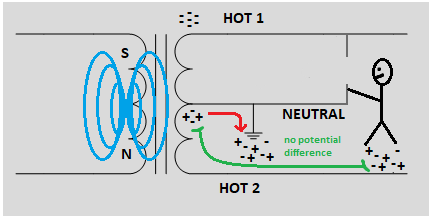 When the circuit is closed, are hot 1 and neutral both "hot"? That is, are they both carrying a current of 120V that is alternating back and forth? First, "a current of 120 V" doesn't make sense. The units of current are amperes or amps. Volts are a unit of voltage (potential difference), not of current. You can have a current of 1 amp, or a voltage of 120 V, but a current of 120 V is as impossible as a length of 20 pounds or a price of three meters. When the circuit is open, there is no current flowing. 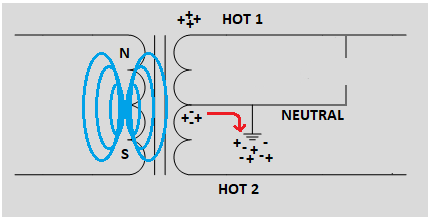 So, what are the electrons in hot 1 doing? Are they still oscillating back and forth? 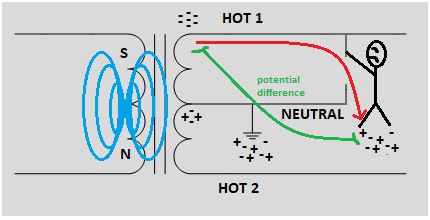 If there is a parasitic capacitance (there is) between the hot line and either the neutral line or the actual earth, then to a certain extent, the electrons in the hot wire will indeed flow back and forth charging and discharging this capacitive "load". When the circuit is open, the neutral is not "energized" like hot 1. Why not? The neutral line is not energized whether there is or isn't a load. Because it's tied to actual earth ground, it can't develop a potential relative to ground, and so if you touch it or connect a load between it and ground, it won't produce any current through that load. It can't produce any potential relative to ground because if there were a potential relative to ground a large current would flow (momentarily) and equalize the potentials. When the circuit is open, a small current might flow in the neutral line due to parasitic capacitive "loads" I mentioned above. 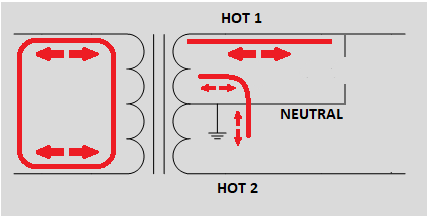 When the circuit is closed, both conductors are carrying a current which is dependent on the load. The phrase 'carrying a current of 120V' is nonsensical. 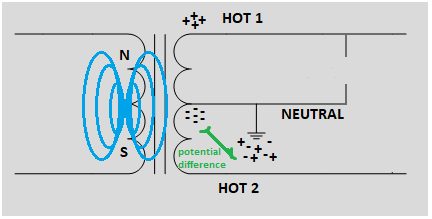 It is not the case that hot and neutral are both hot. 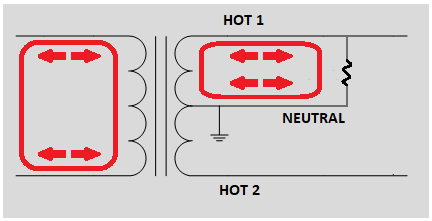 Hot is always hot (120V) and neutral is always neutral (0V) regardless of whether the circuit is closed. For instance, you can touch the neutral wire with the circuit closed and you will not get injured HOWEVER do NOT actually try this experiment because there is non-zero risk that something is wrong with your wiring and you can get hurt. Conversely, you can touch the hot wire with the circuit open and you will certainly get injured. Ignoring secondary effects like capacitance to ground, the electrons are taking a rest when there is no current flowing. Of course, they are still physically moving due to momentum, thermal energy, etc. but they are not moving to and fro under the effect of an electric field as they would if the circuit was closed. 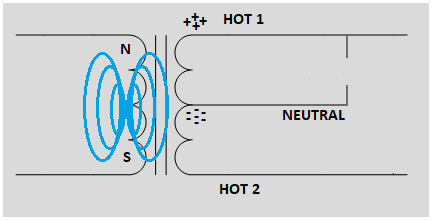 When the circuit is open, the neutral has no current flowing through it. The electrons are doing what they would be doing if you had a piece of wire laying on your table, connected to nothing. I'm not sure why you'd think that electrons would be going back and forth into the ground? If you stick a piece of metal in the ground, do electrons continually go back and forth from the metal to the ground? Even if the circuit was closed, electrons wouldn't be going back and forth into the Earth. As an aside, (this may be an unpopular/controversial opinion) but I don't believe you need to know what's happening at the electron level to understand basic electricity. Even at the advanced level, the electromagnetic waves that the oscillating electrons are generating are far more consequential than the electrons themselves. It only becomes really necessary to ask yourself 'what are the electrons doing?' when/if you study semiconductor physics. Even then, you don't need a PhD in semiconductor physics to successfully design a circuit including diodes and transistors (which is good, because that stuff can get seriously complicated at an advanced level). Focusing too much on the electron when one first begins to learn about electricity leads one to such incorrect conclusions as 'electrons travel at the speed of light in a wire', 'conventional current flow is incorrect', etc. Lets try looking at it with water instead of electricity. Go outside, consider the garden faucet. Inside the pipes there is probably something in the ballpark of 60 pounds per square inch of pressure. (This can vary considerably depending on where you are, though.) This is the equivalent of your hot wire. Outside the faucet there's no pressure, that's your neutral. Open the faucet, water comes spitting out--that's current. You still have pressure in the pipes, though, and you still don't have pressure outside the pipe. The pressure of the water isn't enough to harm you, though--it's more like a 9V battery than mains power. Not the answer you're looking for? Browse other questions tagged current transformer ac grounding or ask your own question. Do electrons actually flow when a voltage is applied? How much current actually passes along household neutral? With a 1:1 transformer, what differences in noise reduction will a floating-neutral secondary exhibit, compared to a grounded-neutral secondary? Why have a ground rod?